We have a problem with our siding on front and back of our 2 story home. It is occuring on first floor only, same area in front as in back; i.e., not entire house. It is dark brown in color and feels sticky. I can remove it with bleach, however it returns after a short time. Our home was once stained dark brown and the problem was noticed after restaining a much lighter color so it may have been occuring for awhile. The house is 15 years old. I have had 2 roofers and plumbers out to see, and everyone is stumped. The siding looks like it is bleeding. Anyone encounter such a thing before I start tearing off siding and/or interior ceilings? Thanks for your input. What type of sidding is it ? What style of home is it ? I,ve seen a few instances, from birds, bugs and bees to sweating and leaks !! Keep in mind sidding is meant to shead water and not water proof. 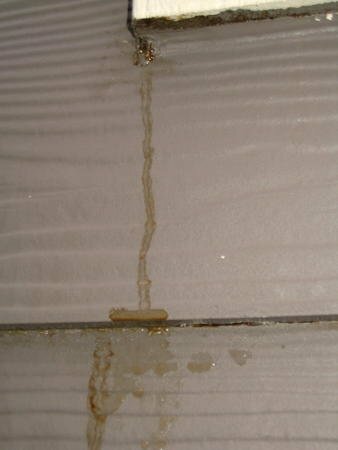 Water developeing behind or carried behind, picks up particles, and stains will occur where it drains. Underlaymeant should be water resistant and allowed to breath. We have cedar clapboard and our home is a 2 story colonial. We have had 2 roofers out and both agreed the roof seems intact. If the water source is from an interior pipe - water or drainage - wouldn't we also see water damage inside? How do insects/bees create water damage or bleeding? OK, Colonial two story, clabboards, leaks on first floor only, good clues. step by step I`ll eliminate possibilities. Clabboards lap 1" 3/4 minus exposier. If you have additions with roof lines diagonnally down the plane, the first piece of stepflashing MUST drain on to the face of the last cut siding that starts up the run. A good way to tell is that you should be able to see the bottom of the first stepflashing. If you see the stepflashing drain behind the siding, the paint under the butts will keep it from draining out and still, if the lap is below the first stepflashing all the water will drain behind all the siding and the Tyvex paper or underlayment will keep it from showing up inside for years,but it will travel and show up on joints and weaknesses in the paint as drips that appear as bleeding. Also check the foundation to see green growth indicating draining from behind siding. If the siding is cut too close to the roofline you will get the same results as above. If you have no lower rooflines, disreguard this reply and I`ll move on to another possibility. A photo of the entire side of the house would help alot. I actually found this site because I was looking for some information about what I call my "Amityville Horror House" (because it's bleeding)! We also have a 2 story colonial, built in 1979. We have Hardiplank siding. I don't think it was ever stained, always painted. A year and a half ago, we had liquid siding put on the house. Now, there is a section on the second floor (we've seen it a couple of other places, but it's most concentrated in one area) that has reddish brown liquid lines running down, from under the siding. It's actually quite a lot! We suspect that freezing temperatures at night with warmer days aren't helping since we're seeing some of the siding start to bulge outward. On the interior of the home at that point is a closet, though there is a bathroom nearby. We've had some folks come look at it and they have suggested that the gutters need to be cleaned. Well, that was a simple solution, but the problem persists despite our clean gutters. We've checked the attic, but no signs of moisture leaking in there. Sounds like a very similar problem - my husband and I have joked that we should just call a priest for an exorcism. We have cut holes in the ceiling thinking it was a plumbing problem, however, all pipes/drainage seem intact. We think it is a siding problem. Will post pic within a day or two. We have wet insulation as well as ice blocks seen from interior against exterior walls. Please keep in touch. We just washed it off 2 days ago, but as soon as it returns (probably within a week), I'll post pix. After many months we finally solved the mystery! Our laundry room is located on the 2nd floor and our dryer vent hose/pipe disinegrated inside the ceiling. Since I am constantly doing laundry, it was "spewing" moisture everyday into the walls and ceilings which in turn exited through the siding. We rerouted the venting through the attic and out and problem solved. Hope this will help someone else. I just noticed that my siding was bleeding all over the house and the siding has also warped quite a bit in a few places leaving some gap in the siding! We are really concerned why this is happening? Any answer would be much appreciated. Image attached. What type of siding is it ? Either way, warping is almost always due to fastening (not enough) and that leads to improper insallation wich causes all kinds of issues. I cannot find the image attached !! Let`s start with the type of siding and how it`s terminated. Okay, so here we are three years later, and things are no different. We've had people come and take off the siding in that area, just to see if there was any moisture behind the siding. Things were bone dry! The only thing we wonder is this: when we had the house painted a few years ago, several pieces of siding had to be replaced. Could this mysterious brownish bleeding be from having used incorrect nails? Could the nails used to attach siding be rusting? That's the color we're seeing. Neither of us remember whether or not siding had to be replaced in that area of the house or not. We're just brainstorming! So I have read with interest the "bleeding" from the siding. I too have the brownish/Red bleeding going on (East side of the house). I had Hardiplank put on in Spring of 2008. I had significant water damage from leaky windows and so had to replace sheathing and new siding (along with a new pella window). Then last winter (Feb-Mar 2009), I had my first Bleed in one spot. Then just this week (Jan 2010), it finally got above 25 degrees and the bleeding began but in several spots and with a significant volume. I haven't confirmed that it is just on the east side but I haven't seen it anywhere else. I don't have a mosture issue that I can detect. What is the latest on this mystery? You would be surprised how ice can get behind your facsia and accumulate behind the siding. When melting happens it begins to run out the butts. The streaks are what`s left when it dries out after. This happens with all types of siding. The tanic acid from the wood is the stain, even with vinyl, if it hits wood first. Most of the time it is due to roofing flashing or gutters that have weaknesses under ice dams,while rain wont back up. Clogged gutters can do this in the summer too. Thanks OddBall for your reply. I am not sure about the type of the siding. I have attached a picture to this post. Please let me know if you can view it this time. There is a lot of warping as well along with the "bleeding". The builder is Richmond American. Just wanted to comment that you picture shows the same thing I am seeing. I would guess from your picture that you have hardiplank as well but I will yield to those more experienced. Do you happen to have buffalo board/fiber board used for sheathing?? My guess in my case that somehow my buffalo board is getting moisture and the brownish/reddish color is coming from that. Would OSB give the same color?? My problem has only occurred coming out of a cold situation and we just had some nasty snows with whispy like snow that may have gotten undernead the hardiplank and somehow passed moisture through the tyvek and then melted when it warmed up. can you tell I am guessing?? I'm glad someone finally posted a picture of this because it's exactly what I see. The problem now is this. . . I've had roofers come out and assess. They've found nothing wrong. We also keep our gutters clean, since that was one of our first guesses. Are we doing any sort of long-term damage to our home by just leaving it or should we try something else? The bleeding happens on the back of the house, so we are really the only people who see it. It's only a problem in the winter. News flash, "After a cold flash", "only happens in winter" are better clues than that photo will give. C`mon,..show me a little more than that !! A well cleaned and maintained gutter full of ice will allow ..Back Up of ice under dripedge flashing at the bottom (eves) of the roof, it will also allow ice or melting to get behind the gutter if it does not have caulking over the back of it. Both of these senerios` allow the water to get to the back of the fascia, from there to the soffit, from there down behind the siding. Because everything is frozen, gaps and vents or spaces in the soffit are bypassed by ice bridge. If no soffit, even easier. What I see, is run-out of a leak or damming problem, I`ve seen enough stains on clabboards to know. However, this is a first assesment of intel provided, and not me being there. I started with the most common cause from the gutters. There are others, especially if you have dormers or vallies, skylights ect. ect. A wider photo of the wall is needed so I can see the contributors !! To answer the question of long term damage. YES !! Unless the Carpenter ants attracted to it , fix the damage, it will get bigger every season, and that`s not to mention the mold that will settle in or possible framming failure due to it !! We're happy to "fix the damage", but no one can tell us what is damaged. As I've mentioned before, the professionals who have come out can't seem to find anything wrong, so we're stumped. The first roofer who came out suggested that we put exhaust fans in our bathrooms, which we've done with no success. We do have one other professional in mind who hasn't seen it in person (although he has heard about it), and we're going to call him next week. I appreciate all your help oddball. I'll be sure to keep everyone posted. I do feel a little better just knowing that other people have the same problem. Your problem only happens in the winter durring melting, Right ? It`s almost always Ice damming getting behind the gutter or under the roofing. Sometime dormer flashing. To give you better advice, I need a photo of the wall from a few feet back so I can see the entire wall plus gutter/roof, and a photo from the top of the gutter showing inside down the long way so I can see the top of the gutter and roofline. The signs will tell me the rest. I think you have made a good argument that things on the outside are not revealing much. So my suggestion would be to start looking inside. Clearly there must be moisture coming from somewhere. One of the other people on this post indicated that their problem was a leaky dryer vent. Let me tell you what I found and you may want to do some inside investigation if you haven't yet. My Bleeding only occurs in the winter. Here is why. I went up into my attic to do some investigation. I went to the wall where my bleeing is occuring. I pulled the insullation away from the sheating and found the brownish/redish stain on my top plate. After talking with some construnction friends I confirmed what I thought: Warm air from the living quarters is coming through the ceiling and condensing on the cold sheathing. It is penetrating the buffalo board/fiber board and running down the outside finding its way through a seem in the Tyveck and out onto the siding. My construction friends were somewhat suprised that this process woudld create the volume of bleeding that I am seeing. Well that isn't the end of the story. I worked my way to anther point along the wall and found perhaps the major source of my problem. I pull some insulation back and revealed a sewer vent line where somehow a 90 degree elbow had broken and basically my sewer vent was venting right into the insulation, right next to the sheathing (vent comes up through the outside wall). Don't ask me why they did it that way when they built the house but there you go. So basically this warm sewer vent was providing all kinds of moisture to my east wall. Lots of condensation, lots of bleeding. So I am going to address the sewer line and see what happens. Maybe you want to do some exploratory surgery in your attic and see if anything strange turns up. I have the same issue with my siding. This started early this week. Temps outside have been in the 40's with no recent snow storms. I had a plumber come over today and he said this is not a plumbing problem. He suggested it may be a roof problem. Keep me posted on any answers to this problem. My brown leak looks similar to the photo that was posted. The liquid is initially watery but hardens and darkens with time. 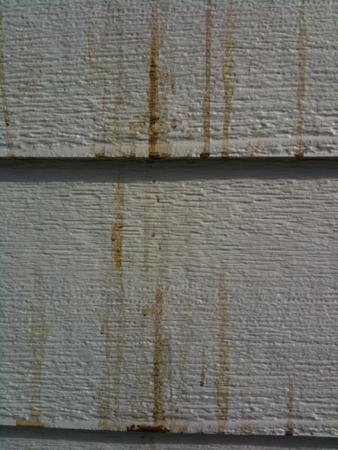 Your siding is more than likely leaking,....There are many many ways your siding will leak. The browish stain left behind is from the tanic acid on wood your leak travels on before exiting in the least resistant spot. (most of the time) Paint under the butts can make it travel and show up in other spots, non level vinyl will let it travel as well. Without details or photos it is hardest for anyone on the Net. to help you, The only fact you can get is that ...yes...your siding is leaking !! But you already know that,...so without being there to watertest or photos to examine signs, that`s pretty much all you`re gonna get. A small photo of the stain on two siding butts like provided earlier, is totally useless !! The bleeding is mostly coming from below that window in the photo but there is an area that is also bleeding just above this window. The plumber said he thought it maybe a roofing problem. The only issue with that is we have had no snow here in a month. I guess it could be frozen gutters but not sure. I am having a roofer come over to take a look. If it is not the roof and not plumbing does anyone have an idea where else this liquid could be coming from? Ok, It is hitting the top of that window and running down both sides. Does it show up inside at the top of the window ? There are a few things that can cause leaks without rain or snow. 1, Vent pipes that don`t have a downward slope (pitch) from the elbow that goes up to the roof back. Condensation will build up and go through joints. 2, Bathroom vents that don`t vent outside via flex hoses or hard lines. 3, If your heater and A/C is in the attick, there should be a drip pan with a pipe to drain out the house under it. This drain pipe should be pitched too. After it goes through the opening, it should stick out into the gutter or far enough so it don`t back track into the opening. 4, If you have attick insulation on the inside of the roof, improper ventilation will condense and run down the foil that is on the other side of the paper backing and down the wall on both sides. 5, Are the roofing nails that come through the wood rusty ? Let me know what the roofer says, and see if he will do a water test with a garden hose. Gutter first, then the roofing from the bottom up. Oh ya,...Do you use a humidifier ? The roofers came out and said this is not a roof problem. The most likely cause is condensation behind the siding. I am being told that there is probably a void in the insulation. When the cold air outside is meting the void in the insulation from the warm house, condensation is formed. I am in the process of trying to find a company with an infrared camera. Using the camera will give me an idea of where the void is located. Once the void is located I will be able to have insulation pumped into that area. Hopefully this will correct the problem. As always I am open for suggestions. -The leaking is not showing up inside anywhere including that window. It seems to now only be running down under both sides of that window. -I don't believe that the roofing nails are rusty. By the info you just gave me, I strongly suggest you have the top of that window tested with a hose. I don`t see any drippings comming out of the sillplate onto the foundation concrete at the bottom. I can`t see the water getting through the house wrap underlayment to the back of the siding either. In any case, let me know what`s discovered !! Would this whole thing start when we have not received any moisture if it were the window? I guess that is the thing that it puzzling me the most, this started when we had not received any rain, snow, moisture at all in over a month. How do I go about testing the window with the hose? Thanks! Now there you go,...throw a wrench in the mix !! No, I don`t think leak now. Maybe a bee hive, I seen that happen before, exterminator kills the bees, the hive leaks later, it`s just that it`s too much for condensation that I`ve seen happen. Ya never know till you start taking siding off and that`s the last step. Let the hose trickel on one corner and see if it comes out the other side. But I`m shying away from that now. It`s not a big deal to remove the siding, just have the correct paint for after. Keep me posted, I`m interested !! So I finally found the cause of my leaking siding and it was of course the most obvious cause, the upstairs shower. Water has a weird way of traveling especially when it can follow studs and come out in an area that does not seem to be obvious. 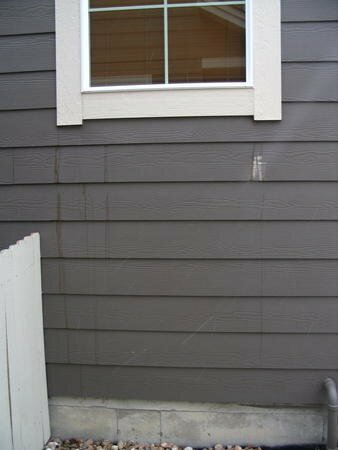 For anyone having this problem, mysterious leaking siding, I would recommend finding someone in your area that uses infrared---it was under $200.00 and worth the price so I did not have to start ripping everything up to find the cause. I have the same problem and am just as stumped. To the person who asked about the humidifier the problem seems to have stopped since I turned down the humidifier. Could this have been the cause? Have Roofers and insurance adjusters baffled. Update . . . my humidifier on my furnace was set to 35%. When the weather turned very cold I saw quite a bit on condensation on the window as well as the bleeding on the siding. Since I turned down/off the humidifier and cleaned the siding I have had to more bleeding. Keeping my fingers crossed. Check out this photo, this doesn't happen every time it freezes but will happen after a few weeks of freezing to warming weather. We have a similar problem with the siding on our house. I've recently added insulation to our attic, along with ventilation chutes down into the soffit area between each rafter. Since then I've occasionally noticed water dripping down the siding. It appears to be coming from behind the siding, but I can't seem to pinpoint the cause. I see this on all four sides of our house, even on the gable sides of the house (so it probably isn't from ice dams). Any help is appreciated--thanks much! A close-up picture of the area shown above. I have a two story home in Lakewood CO. The attached picture shows the 2nd floor outside the bathroom. I'll admit this bathroom was used as a steam room and is not equipped for that. This appears to be bleeding or and not dripping or dirt etc condensed onto the outside of the wall. The better part is that it is water soluble which has me scratching my head. The drips and bleed easily wash off. Thanks for all the insights. I am confident my issue was poor ventilation from bath shower. Clapboards are fine, so how would you recommend I clean it off? My mysterious drippings turned out to be from flashing that was diverting roof runoff directly behind my siding. This was not obvious from observation. The water would seep out from behind the siding at odd locations along the wall. The liquid was brown and thick. When we took the siding down, the plywood underneath was rotten in a small area, but luckily no internal damage.